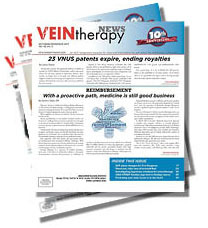 Published bimonthly in a four-color glossy format, Vein Therapy News keeps you up to date on the latest news in the phlebology community. Topics include new vein-related products and technology, industry news, events, and so much more. Please contact us at 800-678-9724 x344 or email our subscriptions department at subs@veintherapynews.com.